The neo-Weberian state constitutes an attempt to combine the Weberian model of administration with the principles laid down during the retreat from the bureaucratic management paradigm (new public management and public governance). The concept of neo-Weberian state involves changing the model of operation of administrative structures from an inward-oriented one, focused on compliance with internal rules, into a model focused on meeting citizens’ needs (not by resorting to commercialisation, as is the case with new public management, but by building appropriate quality of administration). This book discusses the context of the neo-Weberian approach and its impact on the processes of societal transformation. Further, it identifies and systematises the theoretical and functional elements of the approach under consideration. This volume includes comparative analyses of the neo-Weberian state and public management paradigms. In the empirical part of the work, its authors review selected policies (economic, innovation, industrial, labour, territorial, urban management, and health) from the perspective of tools typical of the neo-Weberian approach. This part also includes a critical scrutiny of changes which have taken place in the framework of selected policies in recent decades. The study assesses the appropriateness of the neo-Weberian approach to the management of public affairs regarding countries which have modernised their public administrations in its spirit. One of the aims of this analysis is to answer the question whether the application of neo-Weberian ideas may result in qualitative changes in the context of public policies. The final part of the book covers implications for public management resulting from the concept of neo-Weberian state. 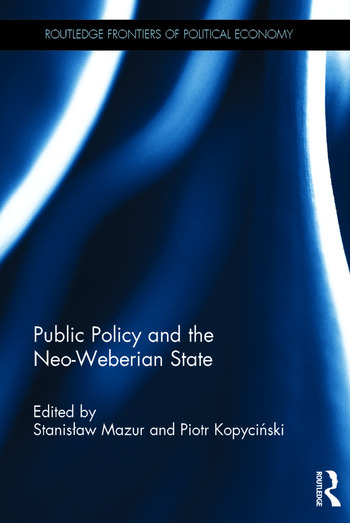 Public Policy and the Neo-Weberian State is suitable for researchers and students who study political economy, public policy and modern political theory. Stanislaw Mazur is Professor at the Cracow University of Economics, Faculty of Public Economy and Administration, Poland, and is Dean of the Faculty of Public Economy and Administration. Piotr Kopycinski is Assistant Professor at the Cracow University of Economics, Faculty of Public Economy and Administration, Poland, and is an expert in more than 20 research and implementation projects in the analysis of public policy, innovation, local and regional development.